At 33 weeks, the babe is still getting hiccups at least once daily. Also, he or she is still moving a bunch after I eat. Every so often the babe tries to stretch out and my belly looks like a football for about a minute or so. It’s hilarious! My cold symptoms are gone. Yay! I am blessed to have the time and freedom to rest as needed during this pregnancy. I know that many women have to keep working up until they go into active labour and I am relieved to not be one of those women. I work, but it’s at home, at my desk, with no supervisors, near my living room; so I can take a nap when I need to do so. On Friday night, I had an ache in the bottom right side of my uterus for about four hours. I wasn’t sure if it was the two to three hours of driving I did (unusual for me since I moved to NYC *and* since getting preggie) or if it was the half a mug of chamomile tea I had before I remembered that preggies aren’t supposed to drink chamomile tea (because it stimulates the uterus and can contribute to pre-term labour!)! I put a hot pad on the sore spot for 15 minutes and when I woke up in the morning it was fine. I started taking the Vitamin C for the cold symptoms and have continued because of my midwife’s suggestion (re strengthening the amniotic sack). I’m not yet at 34 weeks, so I haven’t started the Evening Primrose Oil (also her recommendation, to help ripen the uterus). I’m still taking Fermented Cod Liver Oil/Butter Oil capsules, Enzymes, Probiotics and an occasional dose of prenatal vitamins. I got a Braxton Hicks contraction during the run. Oops. I think I might have done 60 Goblet Squats; but I wasn’t going as deep as I should on account of my new pants that kinda restricted my range of motion. I won’t wear those pants anymore. Bad pants! Regarding the MetCon: I was really happy with the fact that I actually *did* the modified rope climb. This is the first time since getting preggie. And, this is the first time I’ve done Turkish Get-ups! Ever!! Thanks to Coach Iz for the brilliant idea to do them unweighted. Seriously. I hadn’t thought of that. Now I’ve done them. And I feel proud. Also, thanks to Coach Iz for being careful with me today. As much as I put on a macho front, I am highly aware of what I can and can’t do and I appreciate you always checking with me to make sure that I’m comfortable. I didn’t really scale a thing! Sure, I was doing the modified rope climb but so were most of the other peeps. I felt like I could have done heavier Axle Grip Clean & Jerks (with the fat bar) but I didn’t want to tucker myself out. Still… Yay! Gilliebean at 33 Weeks Preggie! 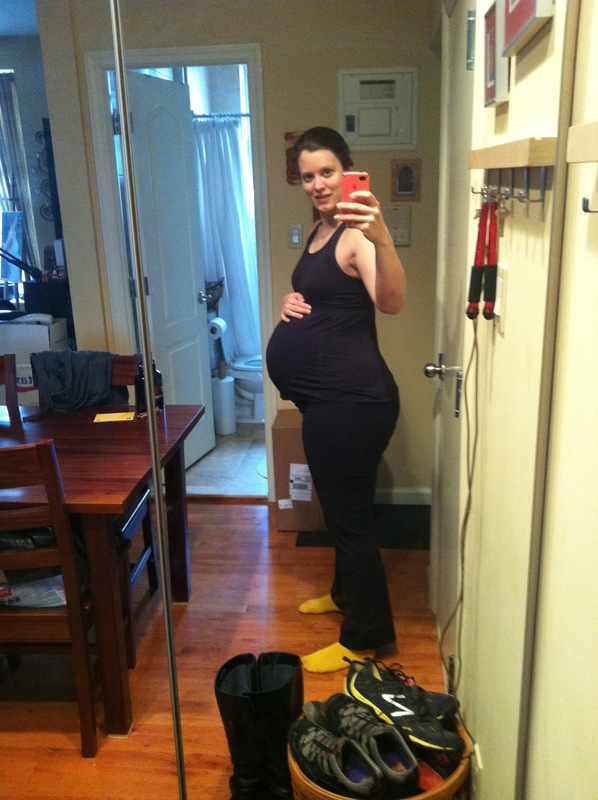 This entry was posted on Monday, February 27th, 2012 at 12:57 pm and is filed under preggie. You can follow any responses to this entry through the RSS 2.0 feed. You can leave a response, or trackback from your own site.